Lemon is such a nice Spring flavor so when a friend gave me some Meyer lemons from her mother's tree, I knew I had to make this cake recipe that I'd pinned. This is a triple layer lemony dessert. First there is lemon zest in the cake batter. Then, you pour a simple syrup of lemon juice and sugar over the warm, baked caked and finally, you glaze the loaf with a lemon glaze. 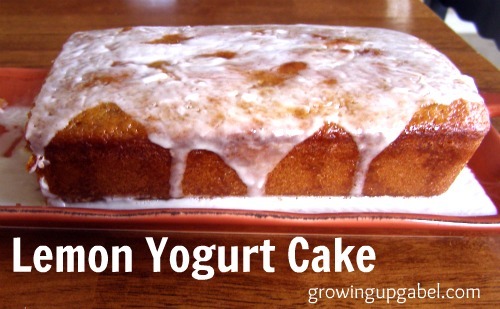 If you don't have vanilla yogurt, you can use plain yogurt and add some vanilla extract to the cake batter. I baked this for about 35 minutes and it was overdone so I'd start checking it around 25 minutes or so, but it could take up to 50 minutes or more depending on your oven and loaf pan. And if you use white sugar instead of brown sucanat like I did, I'm pretty sure your cake will be a nice Springy yellow perfect for Easter or Mother's Day. In a small bowl, combine flour, baking powder and salt. Whisk together. In a large bowl, whisk together the yogurt, sugar, eggs and lemon zest. 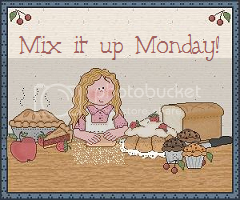 Carefully whisk the dry ingredients into the wet ingredients. Fold the vegetable oil into the batter, making sure it’s all incorporated. Pour the batter into the prepared pan and bake until a cake tester placed in the center of the loaf comes out clean, about 30-50 minutes. While the cake is baking, combine ingredients for syrup in a small pan. Heat syrup until sugar is completely incorporated. Set aside. When cake is done baking, remove from loaf pan (you may want to wait 10 minutes) and place on a cooling rack that has been placed over a baking sheet. Make small holes in the loaf with a cake tester or tooth pick. Slowly pour or drizzle syrup over cake and allow to soak in. Make glaze and pour over cake. I think I need to make this! It sounds so yummy!